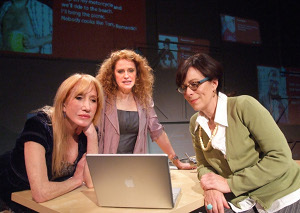 Kathryn Graf’s “The Snake Can,” tightly written and efficiently performed by a stellar cast of six, gets a successful world premiere at the Odyssey Theatre. Steven Robman sure-handedly directs this fast and smooth-paced two hours of involving people and their respective, intertwining relationships. Three women, friends throughout their various failed relationships and everyday ups and downs, deal with and mutually support each other’s current situations. Harriet, convincingly played by the always consistently realistic Jane Kaczmarek, still laments her lonely life as the widowed mother of two as she celebrates the seventh anniversary of her husband’s death. Nina, essayed by the delightfully dour Diane Cary, revels in her newfound artistic freedom, now as the newly ex-wife of popular movie star Paul (Gregory Harrison in a dashing, totally sympathetic performance). Meg, empathetically played by Sharon Sharth, happens to be considered the successful dater of the three as she’s the good-looking, charming single lady of this trio — she’s not! Dating “expert” Meg, with much encouragement from Nina, tries to convince Harriet to try Internet dating, only to find out that Harriet already has an Internet match-up. Meg’s laptop screen of the dating site gets illuminated on the back walls for the audience to share. (Kudos to Hana S. Kim’s fun projection design!) Videos of Harriet’s match reveal Stephen as a hysterically over-the-top romantic Casanova. James Lancaster plays this over-the-top Stephen very well, ably dialing it down to be the realistic Stephen Harriet finally actually meets in person. Joel Polis has fun in his dual roles as Brad, Meg’s failed seduction, and as Stephen’s more-than friend Jake. Jeffery P. Eisenmann’s sleek set design, in combination with Kim’s vivid video projections, deftly delineates and easily transforms the Odyssey stage into Meg’s apartment, Nina’s artist loft, a coffee shop, a restaurant and Stephen’s living room; all with a minimum of set changes. Go see this play about people you could actually care about. Performances continue through Feb. 24, at the Odyssey Theatre, 2055 S. Sepulveda Blvd., LA 90025. Show times are Thursdays through Saturdays at 8 p.m., Sundays at 2 p.m. For tickets, visit www.odysseytheatre.com or call (310) 477-2055, ext. 2.